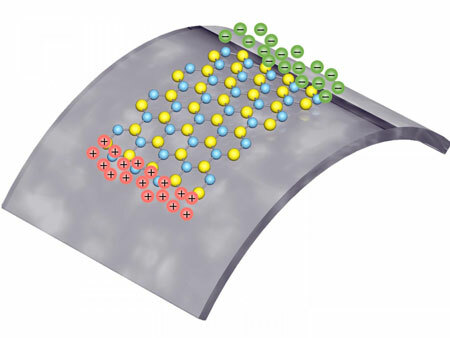 (Nanowerk News) Researchers from Columbia Engineering and the Georgia Institute of Technology report today that they have made the first experimental observation of piezoelectricity and the piezotronic effect in an atomically thin material, molybdenum disulfide (MoS2), resulting in a unique electric generator and mechanosensation devices that are optically transparent, extremely light, and very bendable and stretchable. In a paper published online October 15, 2014, in Nature ("Piezoelectricity of single-atomic-layer MoS2 for energy conversion and piezotronics"), research groups from the two institutions demonstrate the mechanical generation of electricity from the two-dimensional (2D) MoS2 material. The piezoelectric effect in this material had previously been predicted theoretically. “This material—just a single layer of atoms—could be made as a wearable device, perhaps integrated into clothing, to convert energy from your body movement to electricity and power wearable sensors or medical devices, or perhaps supply enough energy to charge your cell phone in your pocket,” says James Hone, professor of mechanical engineering at Columbia and co-leader of the research.